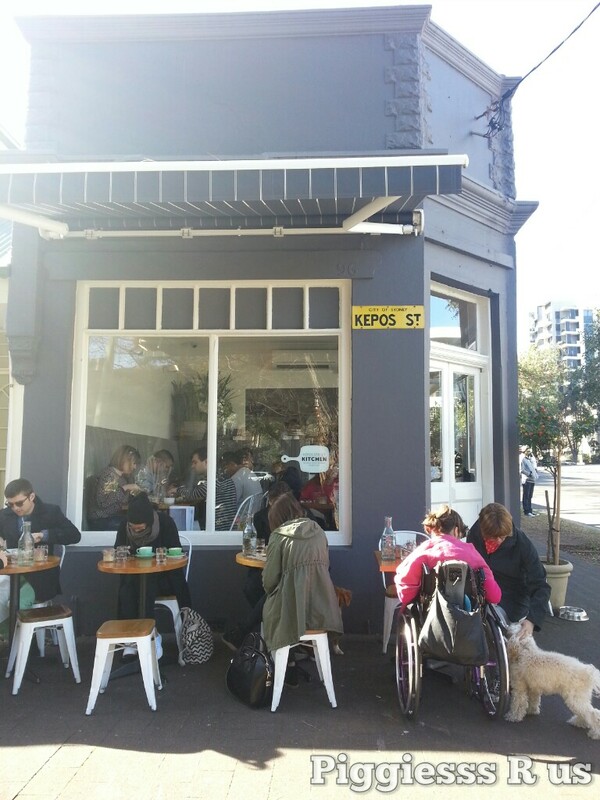 Located near the residential streets of Redfern, Kepos Street Kitchen is a pet / kids / pram / wheelchair friendly cafe / bistro. Serving breakfast from 8.oo am ~ 11.3o am on a weekend, you can choose from the outdoor everything-friendly setting (with less than half an hour wait) or a cosy indoor atmosphere. 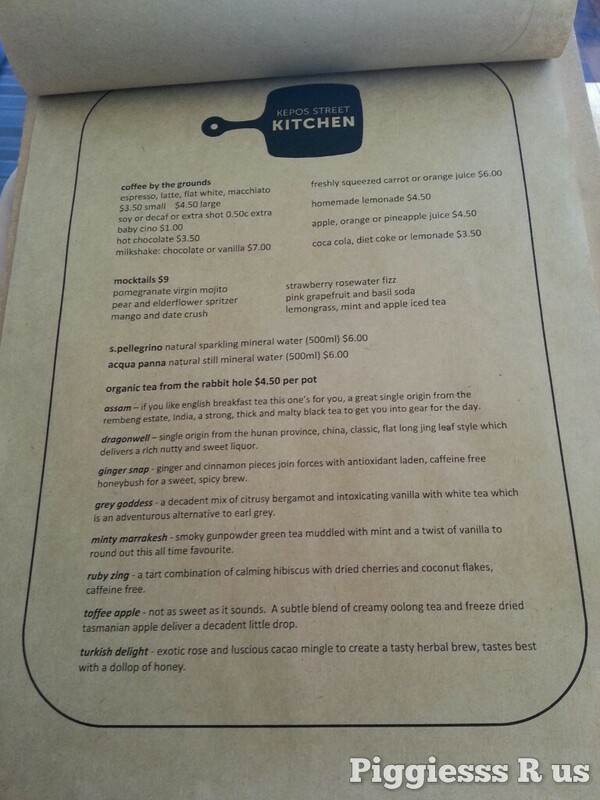 We got seated down and were immediately amazed by Kepos’ breakfast menu as they had a very wide range of choices. 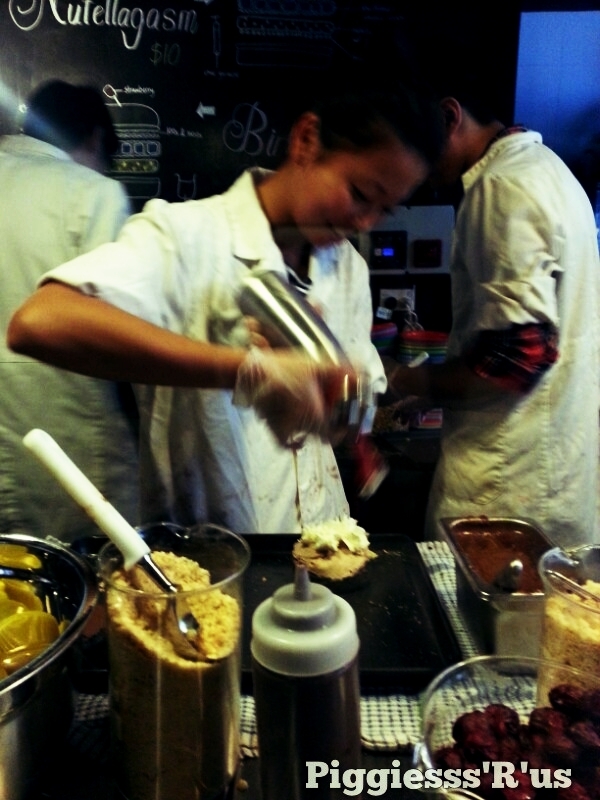 Kepos also had a great range of drinks – coffee by the grounds, mocktails and organic tea from rabbit hole. The small cappuccino with the beautiful latte art flower came quite quickly as we were seated right by the coffee station. Kepos’ cups and saucers had the notable imprints of “The Grounds of Alexandria” on them. Taste wise, although the cappuccino was slightly bitter but we reckon you don’t need add any sugar in their cappuccino. At first, I was quite hesitant on getting a mocktail so early in the morning but we ordered a mocktail anyway from the Kepos’ Drinks Menu but boy! was it amazing! As soon as the mocktail came to the table, you can smell the beautiful rose flavour come through. 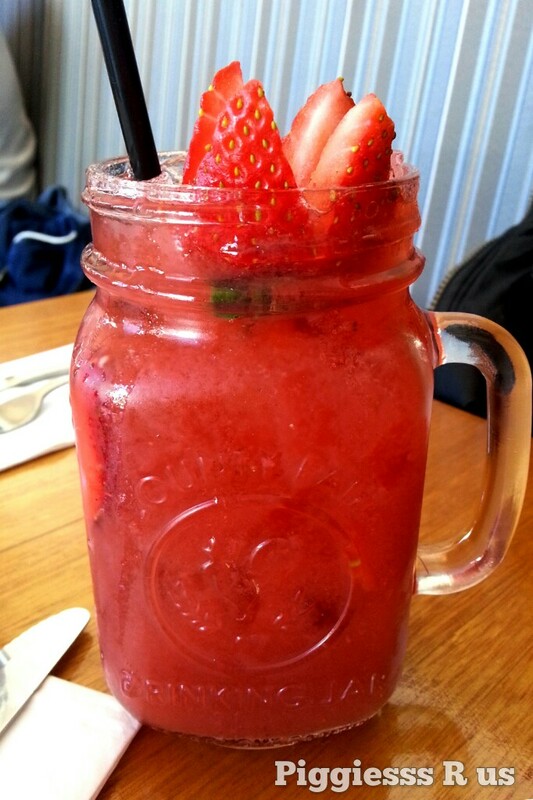 From the first sip, you can feel the soda water fizzing inside your palette from the strawberry mocktail. The drink was rich and full of strawberry juice and once you begin slurping through the drink it was irresistible to stop. With every sip you take from the Strawberry Rosewater Fizz, you can also taste and bite on the little strawberry seeds – a drink that’s perfect to give you a much needed kick start to your day. Kepos Benedict came 5 minutes after our drinks arrived. The whole dish was beautifully presented with vibrant spring-like colours from the top garnishes to the bottom slice of milk bread. We love it when restaurants do their own creative take on typical traditional dishes and Kepos Street Kitchen did exactly just that. They replaced the traditional Hollandaise sauce with a slight twist. 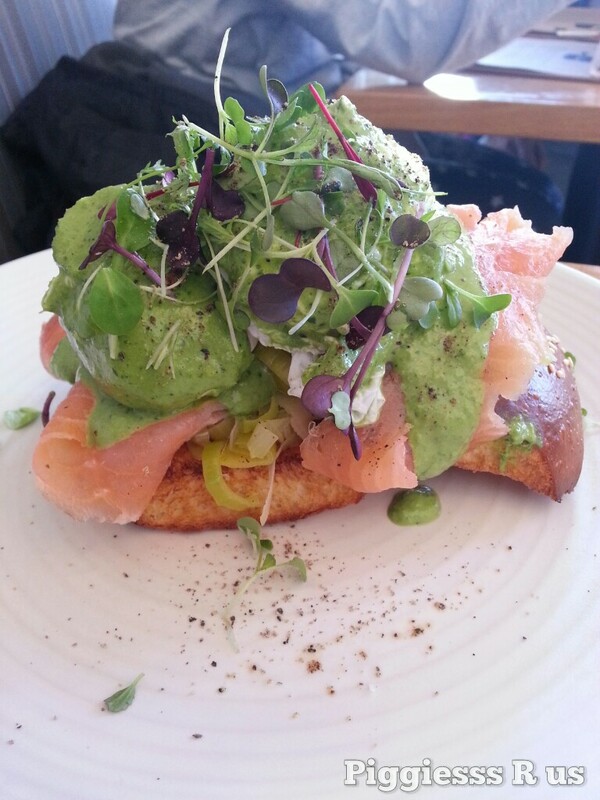 The green tahini had the right consistency of smoothness and its flavours blended in well with their eggs. 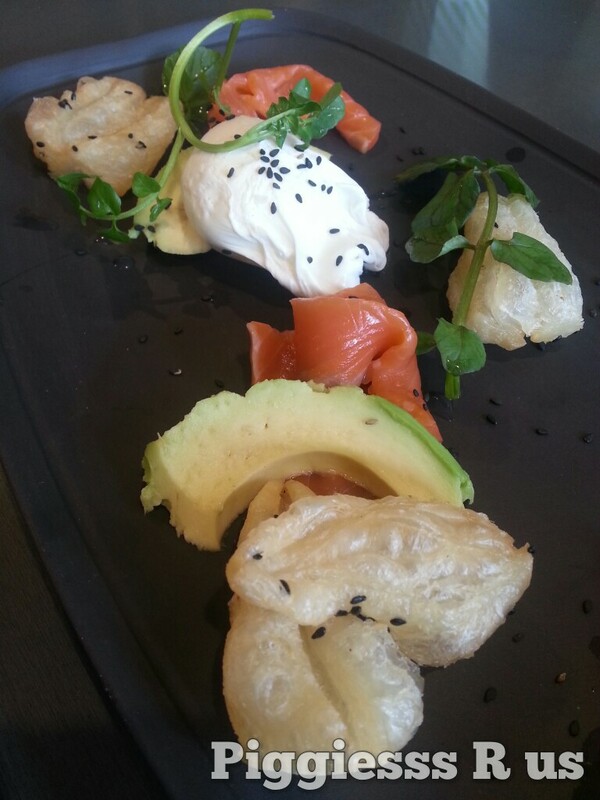 Hidden under the smooth green tahini were two beautiful poached eggs and smoked salmon. For me, the green tahini also acted as a great “dipping” sauce for the soft milk bread at the bottom of the dish. The second dish Moroccan lamb and pine nut cigars was different to what we had imagined. 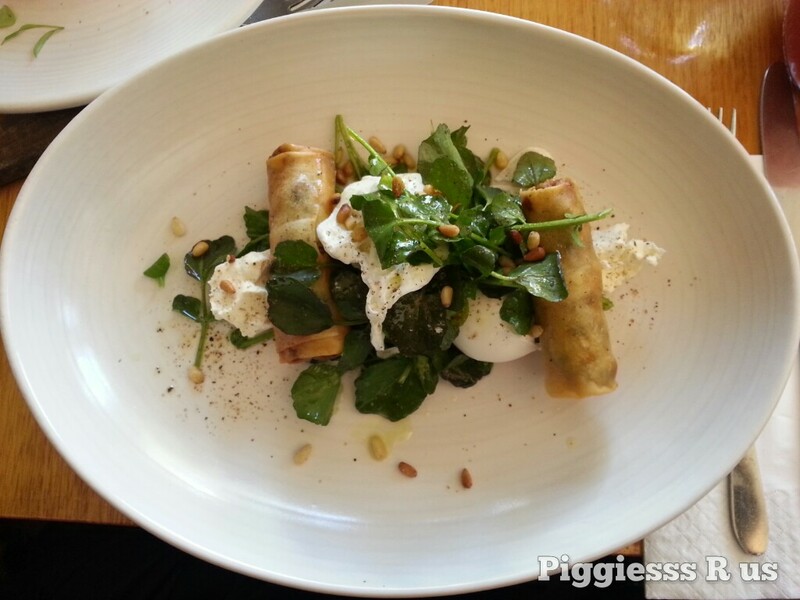 The cigars were essentially “spring rolls” filled with moroccan lamb and pine nuts. The moroccan lamb mince filling was flavoursome and did not have the distinctive taste or smell of lamb. 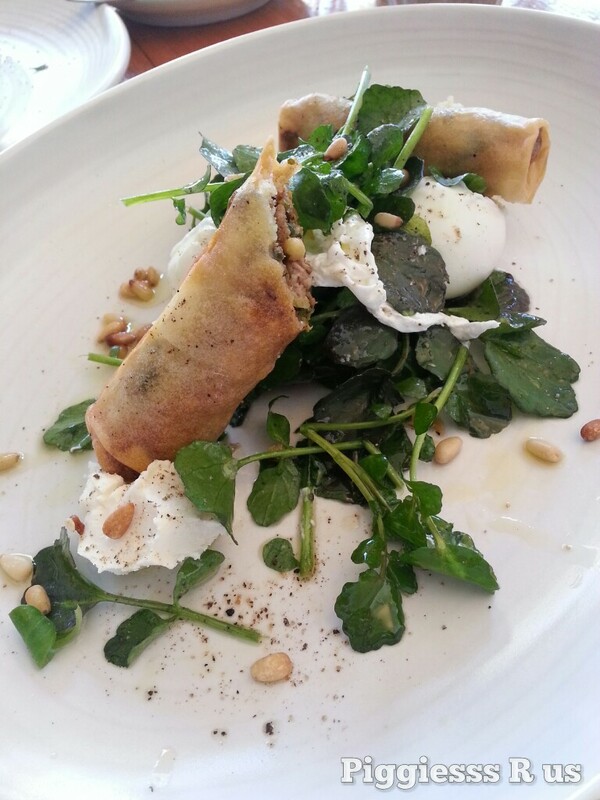 There was a small serving of watercress salad, two poached eggs and soft goat cheese. Again the eggs were poached beautifully but the dish would probably be better if it had more salad. If you are looking to have a full breakfast to kick start your day, you might want to reconsider choosing this dish. Whilst you wait in line for your name to be called, Kepos has a range of desserts for you to snack on and the range is different every time you go. 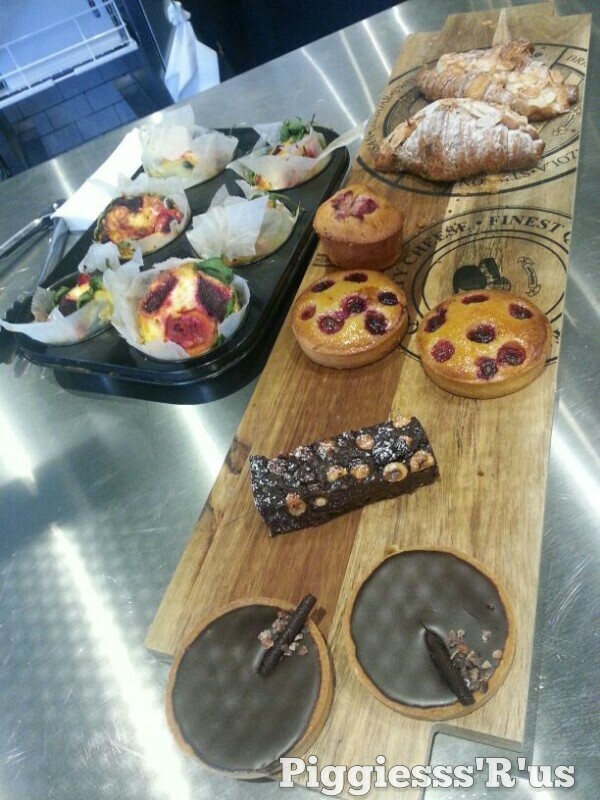 It varies from Chocolate & Cheese Brownie ($4.oo), Lemon Slice ($4.oo), Chocolate, Cream & Caramel muffin ($5.oo), Lemon & Poppyseed cake ($5.oo), New York Baked Cheese cake ($6.oo) Ricotta, Pinenut & Cranberry cake GF ($6.oo). All the desserts were too tempting and only wished we could have chosen them all. We wanted something that was not too overly sweet, so we opted for a slice of the lemon & poppyseed cake. 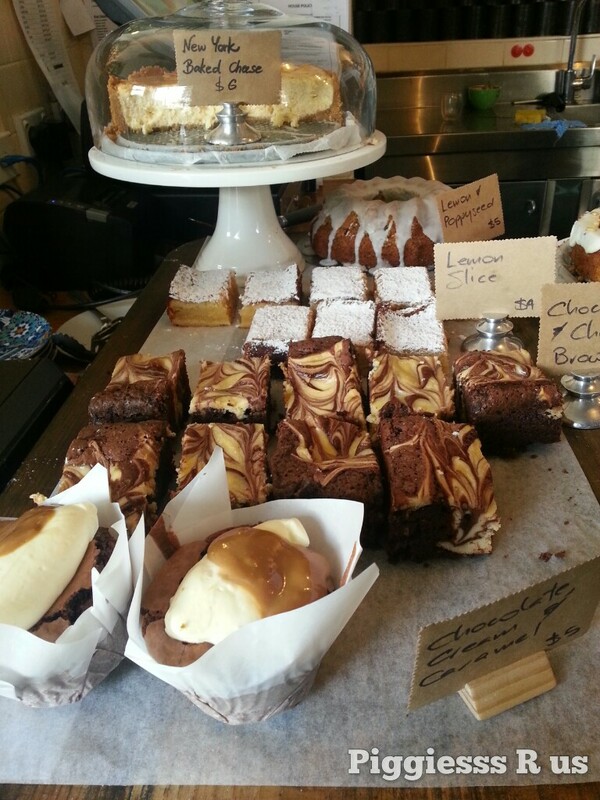 The lemon & poppyseed slice was great to get your tastebuds starting. The lemon cake with crunchy poppy seeds topped off with zesty lemon cream cheese frosting is perfect if you’re not a chocolate fan so early in the morning. One thing to suggest is that they should serve larger slices as we demolished it almost instantaneously but nevertheless give this a try ! We opted for the mango and date crush since we fell in love with the strawberry & rose fizz last time. 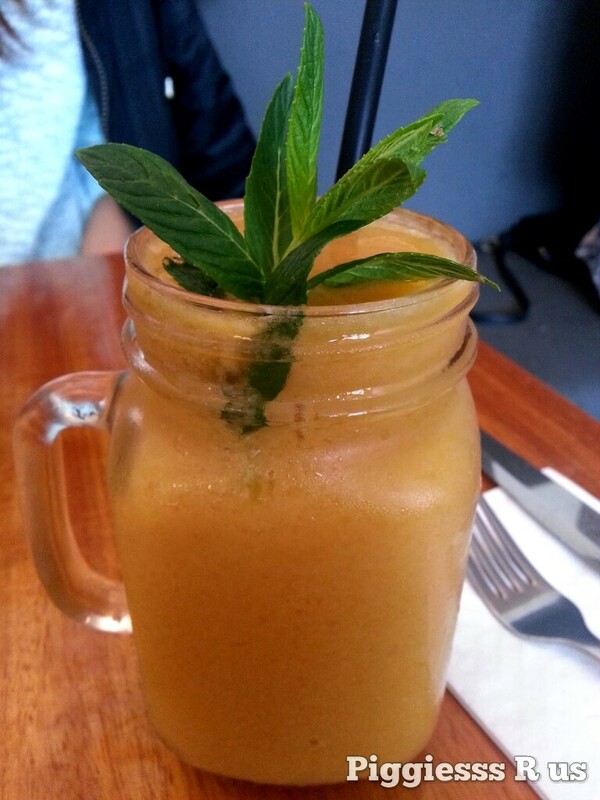 This mocktail had a fuller and richer texture probably because of the amount of mangoes they’ve added to it yummm yummm 🙂 Since mangoes are not in season at the moment, Kepos Street Kitchen probably used “dates” to add to the sweetness. Our first lunch item at Kepos Street Kitchen was the Tunisian style tuna. The presentation was simply amazing ! 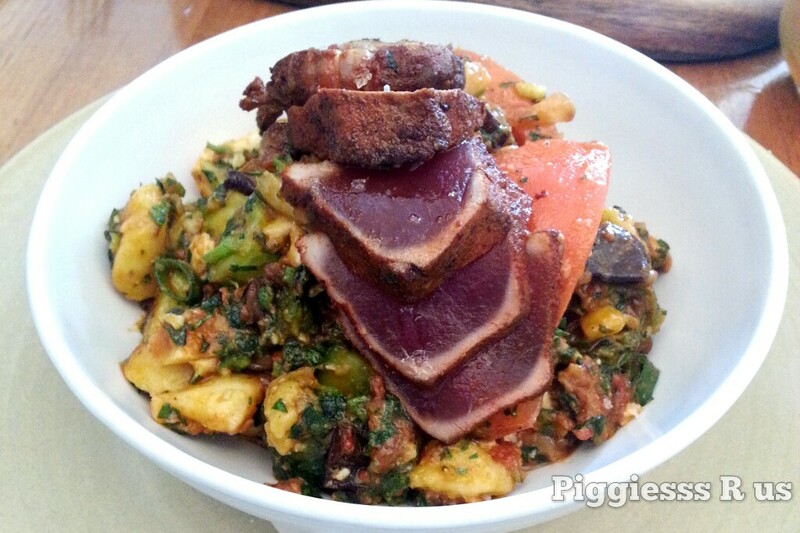 The main element – yellow fin tuna sits nicely sliced up on top of the salad which included a mixture of eggplant, tomato, cucumber, egg and potato. The harissa dressing drizzled in the salad was slightly chilli and generally used as a main condiment in Tunisian dishes especially for fish and meat dishes. The tuna was nicely seared on the outside but firm, thick and juicy on the inside. The helpful staff at Kepos Street Kitchen also asked us whether we would like to add any condiments for our dishes and we suggest that you put some pepper on top of tuna to bring out more of the flavour. As you can tell, we love fried food AND burgers and Kepos Street Kitchen has put our two favourites in the one dish – Southern Fried Chicken Sandwich! As a Mediterranean restaurant, Kepos Street Kitchen adds a Mediterranean twist to the burger with middle eastern coleslaw and a Moroccan mayonnaise (Chermoula Mayo). 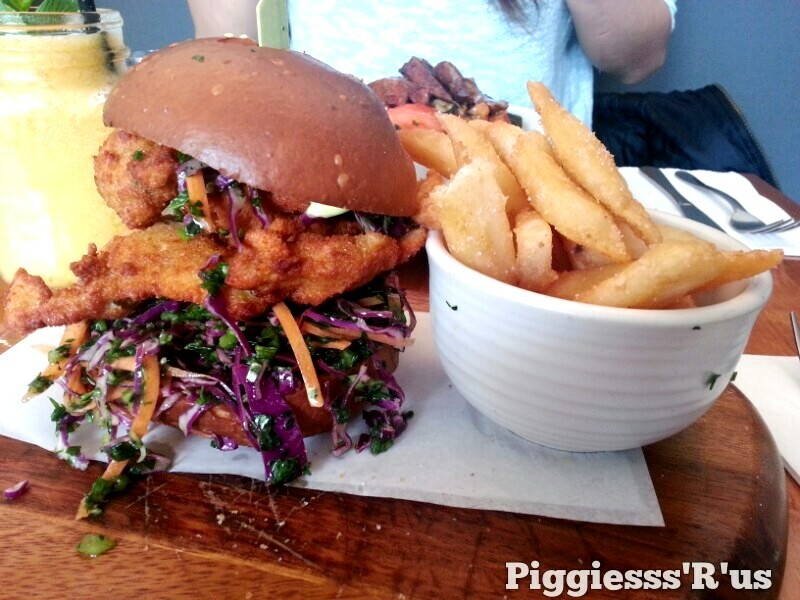 The coleslaw is crisp and fresh which helps bring out the flavour of the Fried Chicken in the burger. Chermoula Mayo also worked really well (!) but we only wished they had a little more mayo in the burger! Tip: Get here a little earlier before the crowd comes for lunch as you’ll probably have to wait about 45 minutes to be seated. 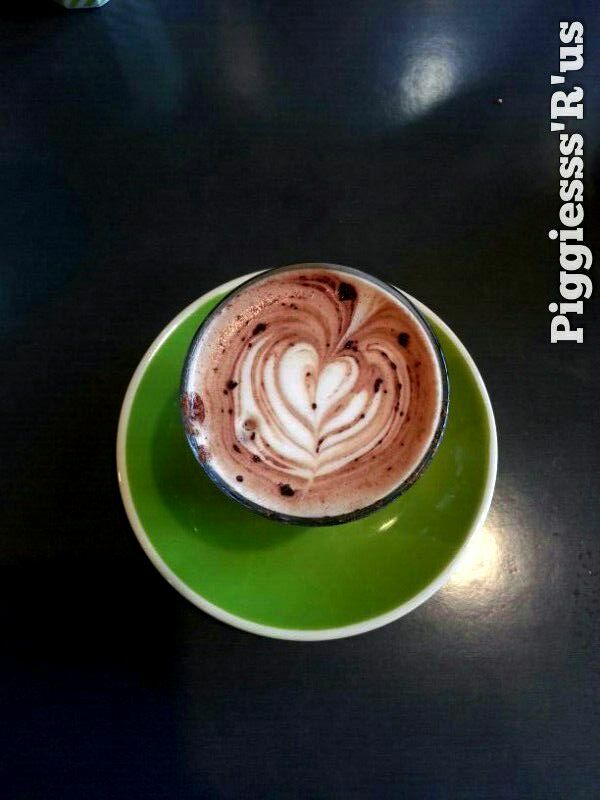 We hope you enjoyed our blog, don’t forget to like our Facebook page Piggiesss.R.Us , follow us on instagram and share our blog with your friends! To celebrate their second birthday, N2 Extreme Gelato (N2) are doing *melt-in-your-mouth* birthday burgers these two weeks ONLY! Located conveniently in the heart of the city at Number 1 Dixon Shopping Centre, N2 is famous for their liquid nitrogen gelato. Priding themselves to serve gelato at -6’C and coming up with intriguing and lovable flavours, this time they have done it again ! 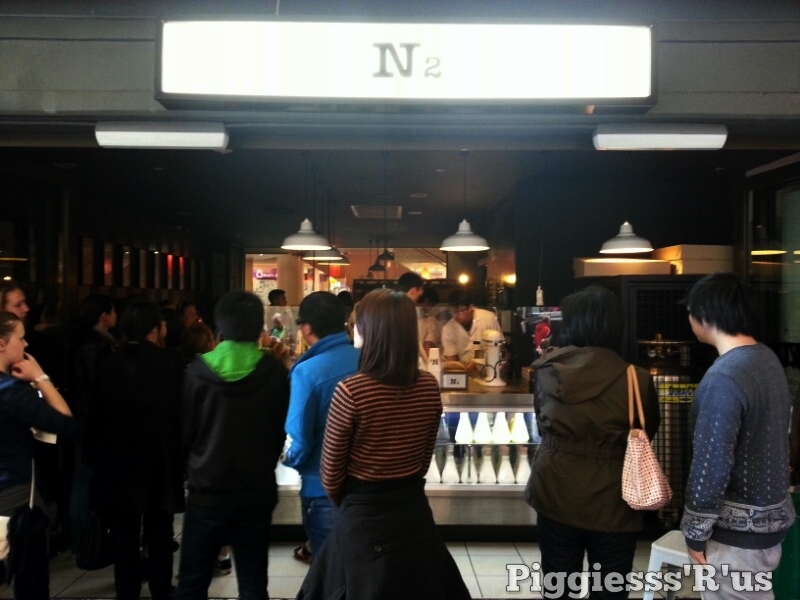 We arrived at N2 and there was already a massive line of people waiting at 1pm ! 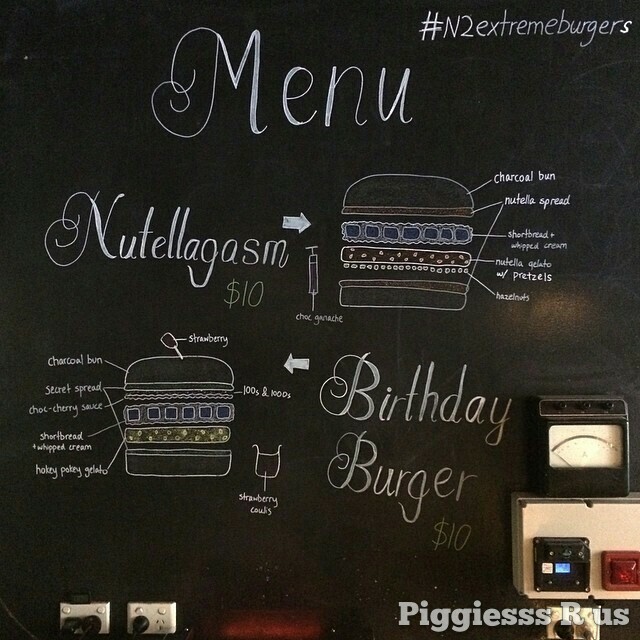 On the menu board, there were 2 specials to choose from Nutellagasm and Birthday Burger. 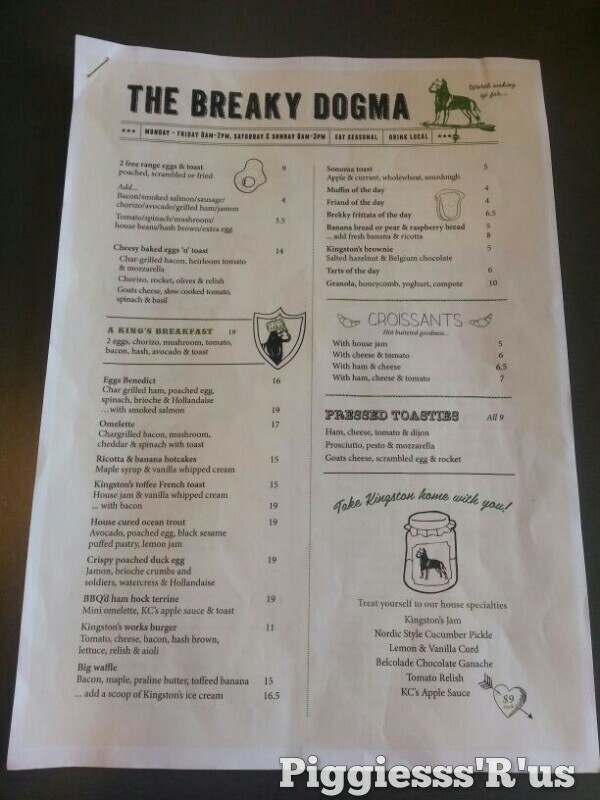 We ordered the Nutellagasm since we loveee chocolate and lurveeed nutella !! Although there was a 20 minute wait for the burgers to be prepared, we were super keen to see how they make their burgers ! N2 had all their procedures in place so that the staff were each responsible for their own particular area. Cream Lady : Sprinkle shortbread on the top bun, delicately place 5 dallops of cream on top of the nutella gelato and pop the top charcoal bun back on ! It was so pretty, you wouldn’t know where to begin to destroy it. We first bit into the burger and the first bite of the nutella gelato was so smooth, it melted straight into my heart! 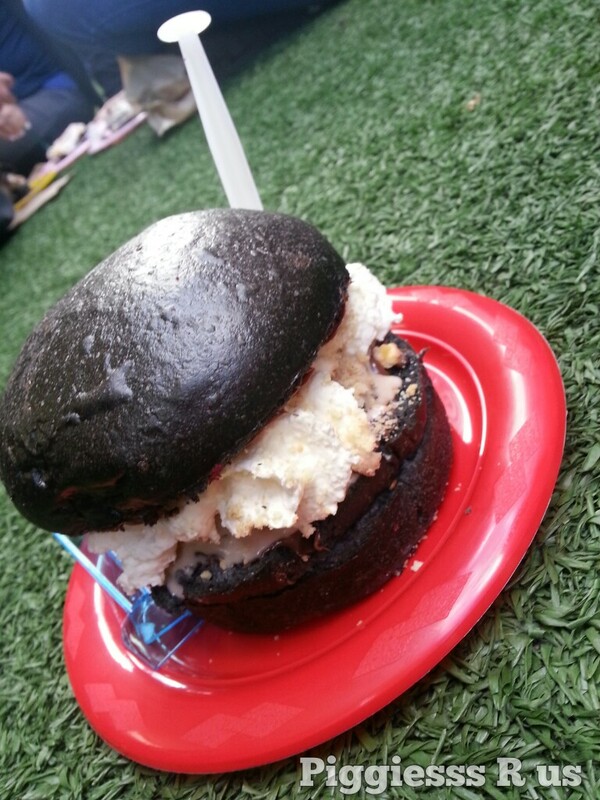 The charcoal burger was soft and did not have a burnt smell or taste, instead it acts as a cushion (perhaps for people with sensitive teeth). Of course the hard thing is ONCE YOU START, you really CAN’T STOP!!! With the second bite, the cream just started oozing out at the corner of our lips … mmm… it was IR-RE-SIS-TI-BLEEEE !!! Not only was the Nutellagasm super smooth, but you can also hear the crunchiness of the pretzels / hazelnuts / shortbread in the Nutellagasm. This burger was really a match made in heaven for me ** ahhh ** and as the name suggest, it really WAS the NUTELLAGASM !! 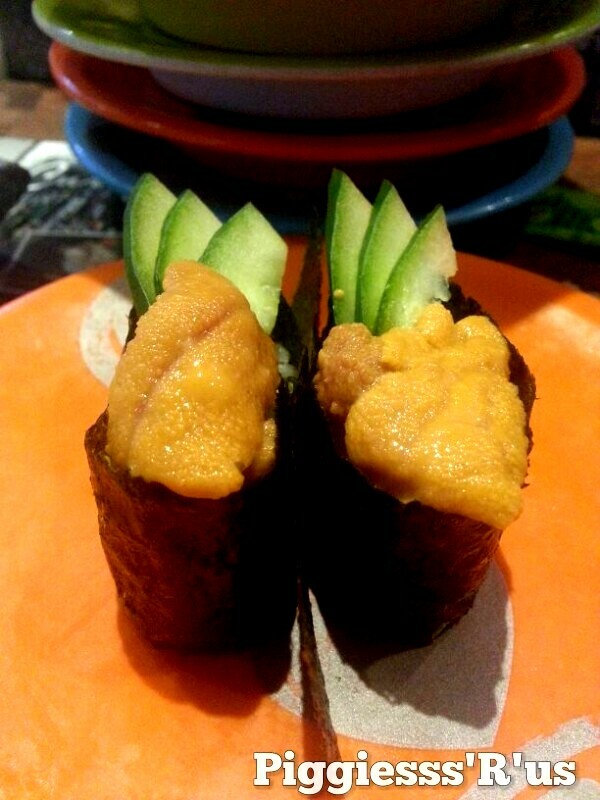 *super SUPER yum YUM * !!! 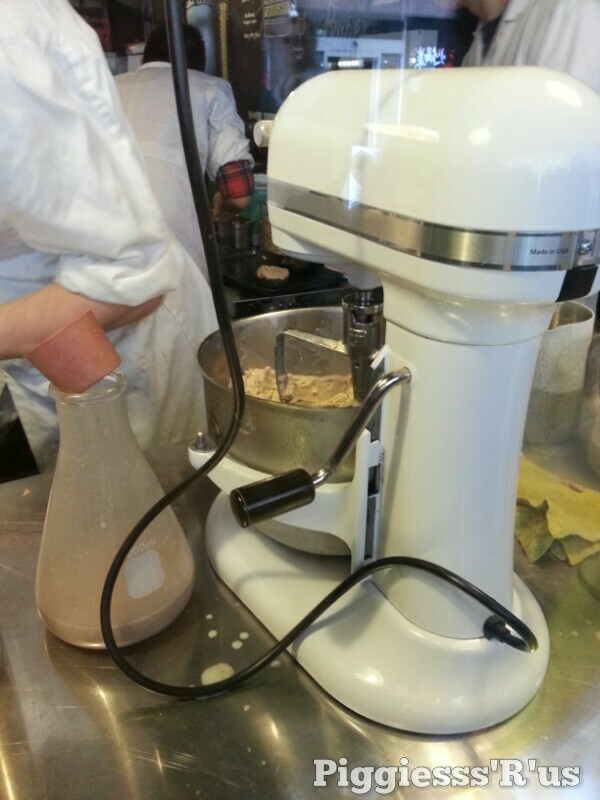 We really can’t wait to try the “Nuts in Yo Banana” at N2 this week !!! and I reckon this will be just as good as the Nutellagasm ! 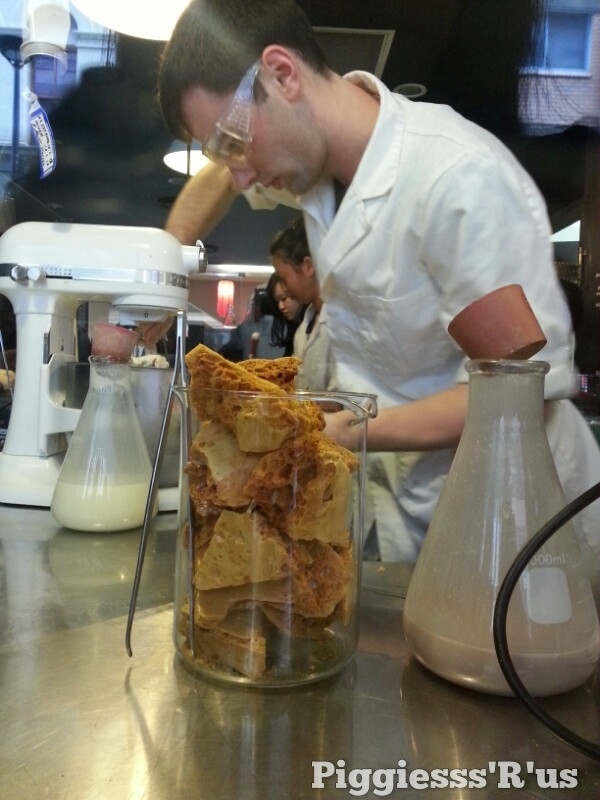 (-) Limited time only – the burgers need to stay !!! As the weather gets colder this winter, our tummies are CRAVING for hot and spicy foods to keep us warm and NaruOne is just what we need. 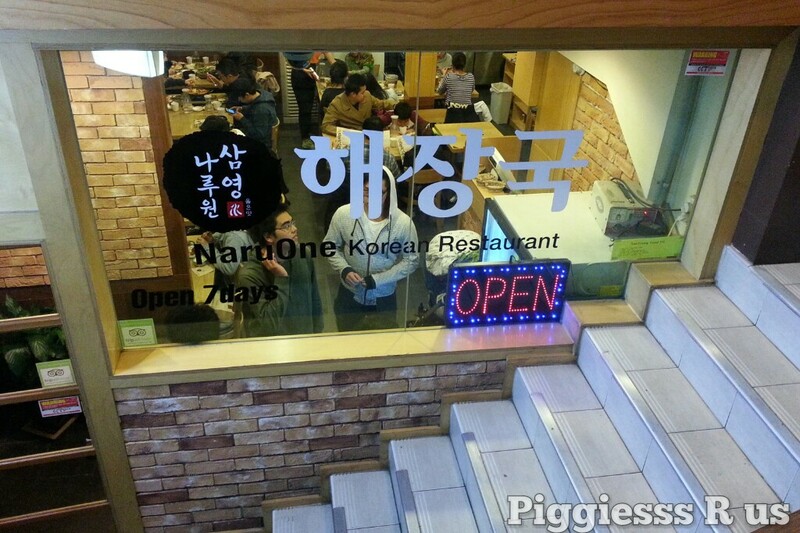 Located in Koreatown on Pitt Street, NaruOne is unlike other restaurants as it has a unique basement-level entrance (behind the signs and photos of their menu) where you’ll need to head downstairs. 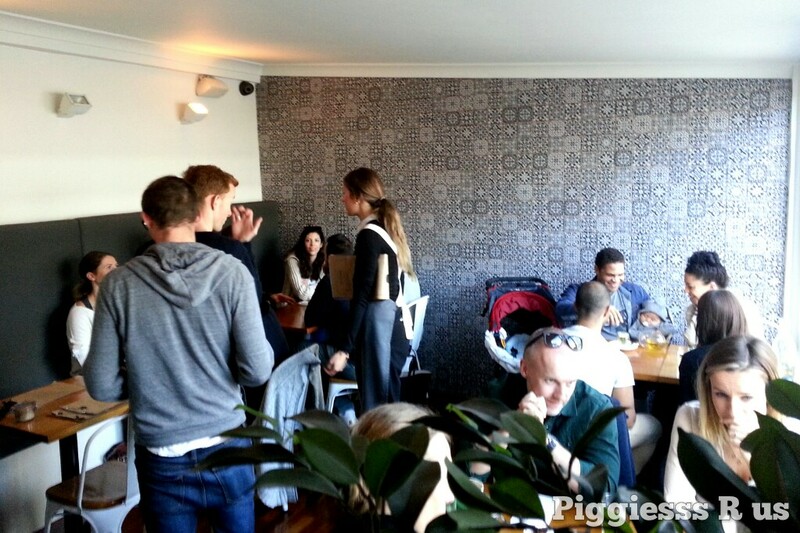 As soon as you walk in, you can start hearing the chatter making it a good lively restaurant from the first impression. We’ve been here a few times now and the one thing that keeps us coming back again and again, is – Yes! You guessed it! The famous fried chicken! 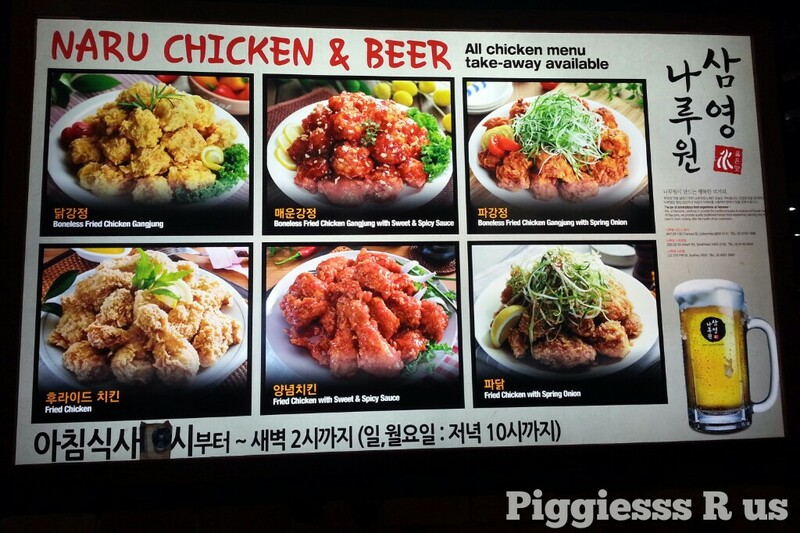 They even subliminally advertise it on the wall so that you can order it ! 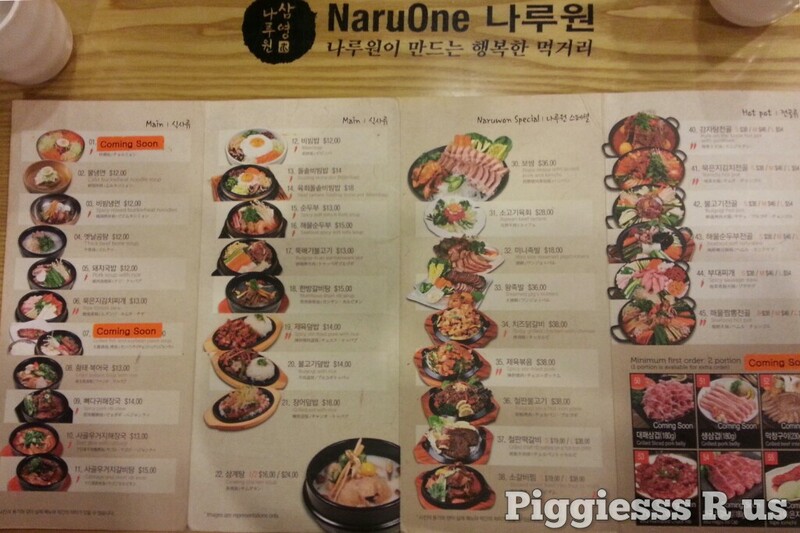 But here’s a look at the menu first – NaruOne also has a good range of Mains, “Naruwon Special”, Hot Pot, Side Dishes and NARU Chickens to choose from. They also have a chilli indicator next to each dish so that you can choose how spicy you’d like your food. 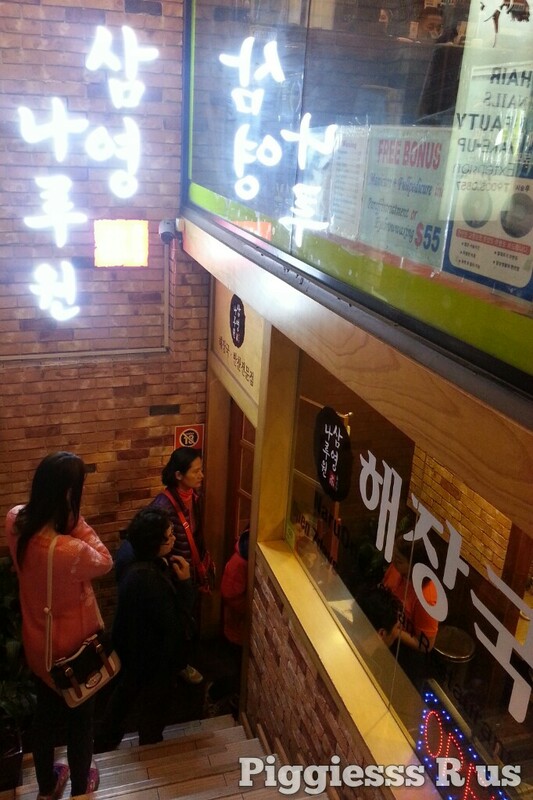 The NaruOne staff were friendly, helpful and efficient with food as the food was serve nice and hot. We didn’t have to wait long for our food to come because as soon as you place your order, the side dishes (BanChan) starts coming your way with (L-R) KimChi, bean sprouts and fishcake. 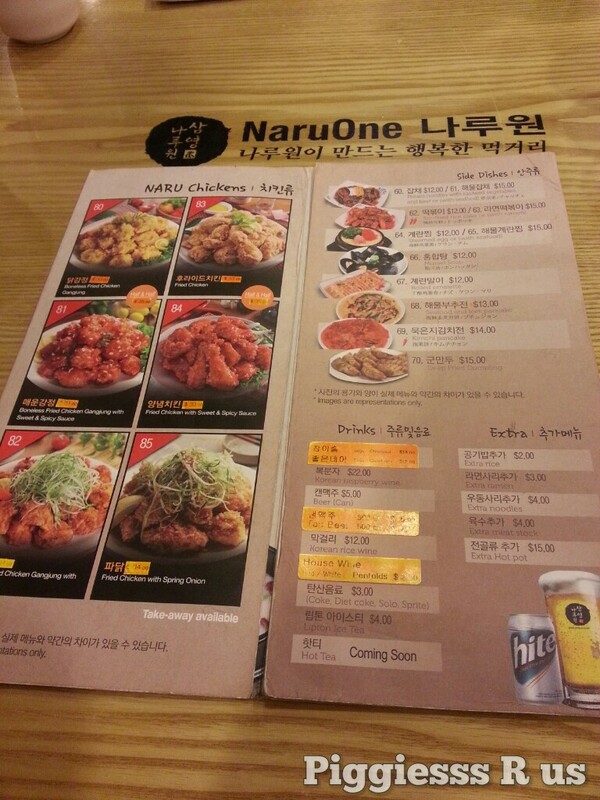 If you’re going for the NARU chickens, NaruOne gives people the choice of different flavours and styles. As you bite into the Boneless Fried Chicken, you can hear the crunch and feel the crispness of the fried chicken. On the inside, the meat was not dry at all, these NARU Chickens were juicy and very tender. 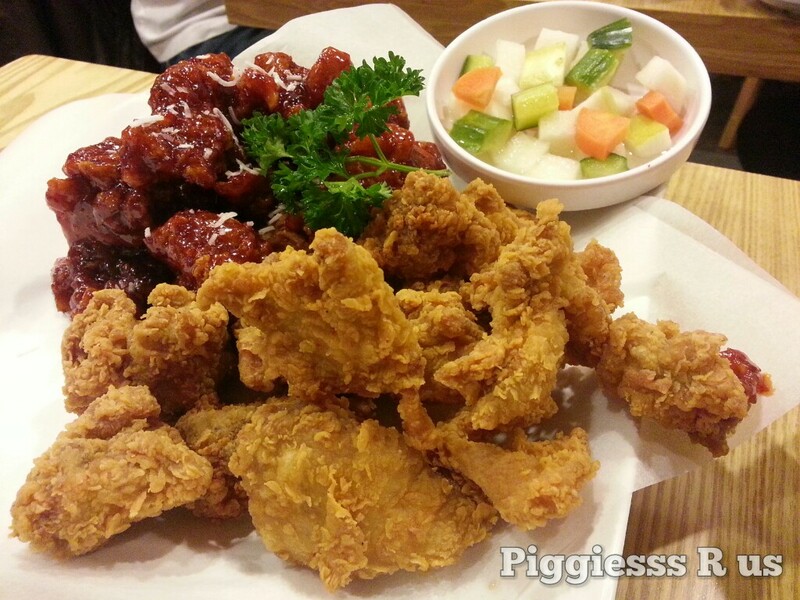 The Fried Chicken with Sweet & Spicy Sauce had a bit more taste and flavour to it. The sauce was sweet and slightly chilli and is blended in with each bite of the chicken. There was also a little bit of stickiness (probably from the sweet honey coating) which definitely got our taste buds going. 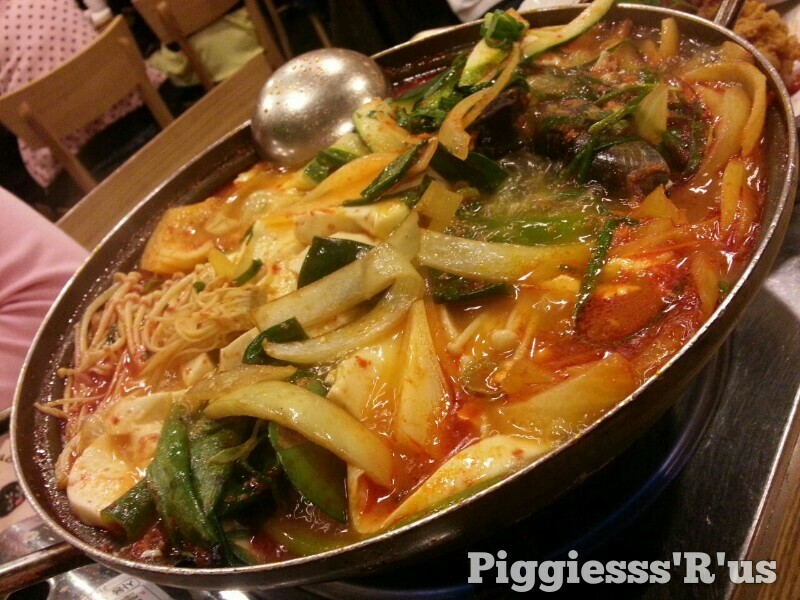 To warm our hearts up this winter, we also wanted a Korean hotpot. At NaruOne, you first have to choose which hotpot you want from their menu, you then have three sizes to choose from – small, medium and large. 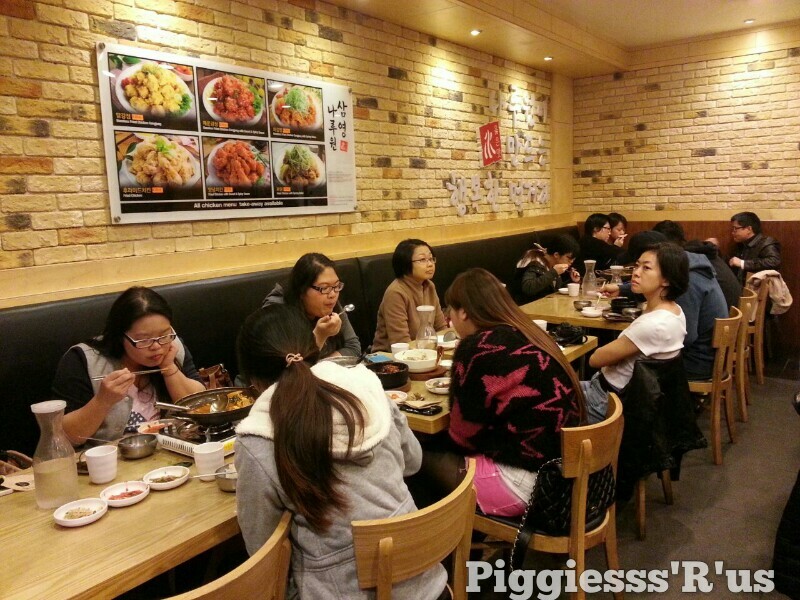 To serve 2-3 people, we decided that ordering for a small hotpot was enough, after all – fried chicken was the highlight xD ! For us, we love our hotpot especially chilli ones with a large variety of vegetables and meat / seafood, so we ordered “Seafood Soft Tofu Stew”. One thing we also love with hotpot is that the longer you leave the veggies, the more flavour it absorbs in the chilli soup which gives it a stronger flavour. 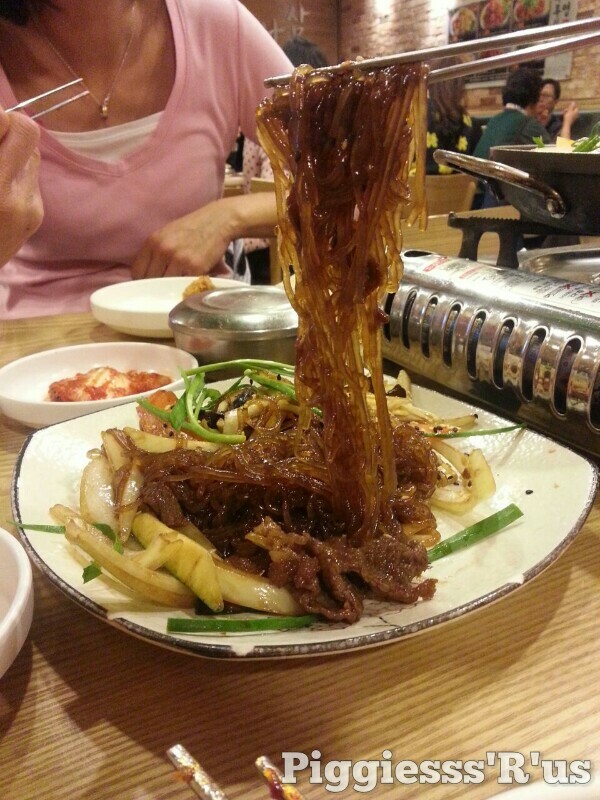 The third dish we ordered was the Potato Noodles (otherwise known as JapChae). 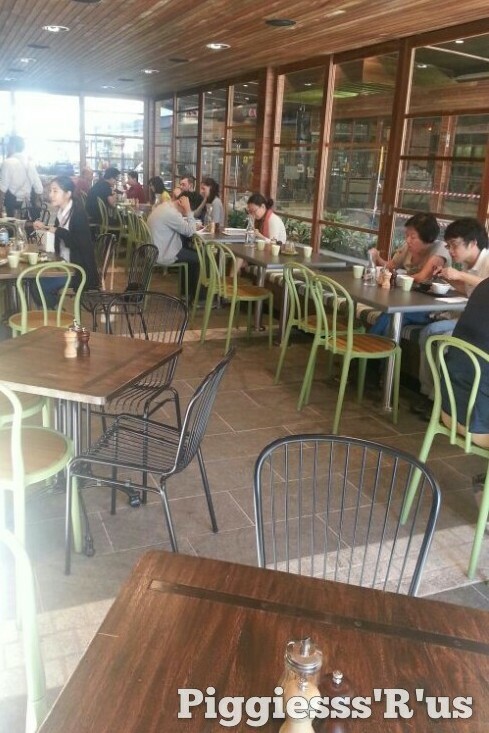 On NaruOne’s menu, there’s a choice of either beef ($12) or seafood ($15) depending on your liking. We ordered the traditional JapChae with beef as we already have other foods as mains. 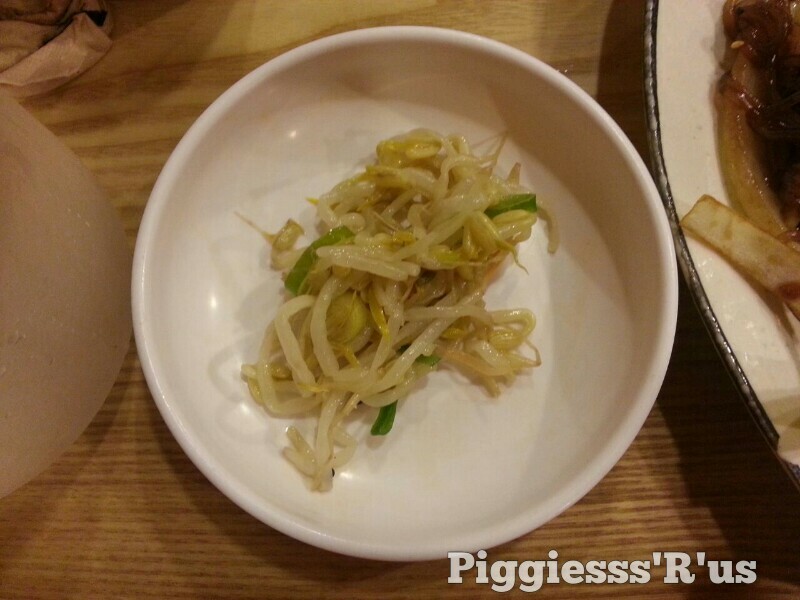 The Japchae portion size is decent as it is meant to accompany our main dish which was good. However if they included more sauteed vegetables for this dish and made it slightly less soggy then it might have been even better. 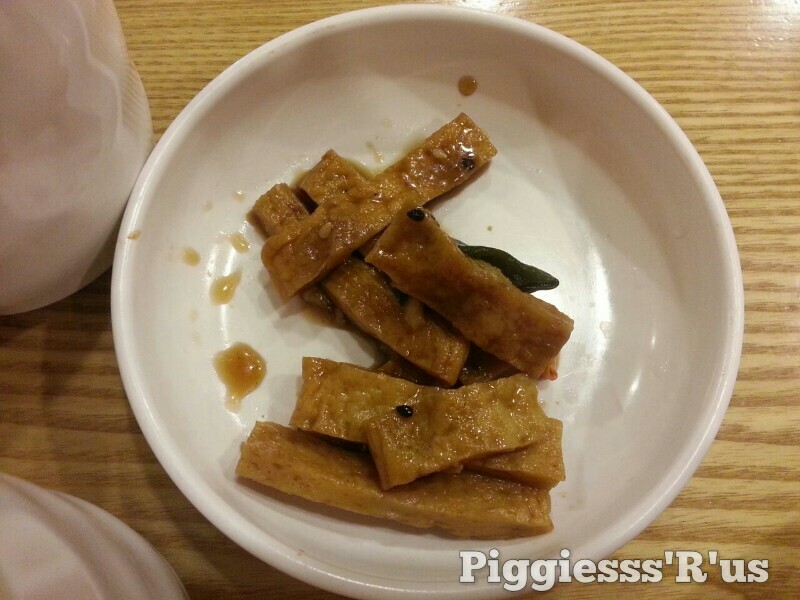 OVERALL we would go back to NaruOne again – as we have in the past and perhaps try other dishes too ! 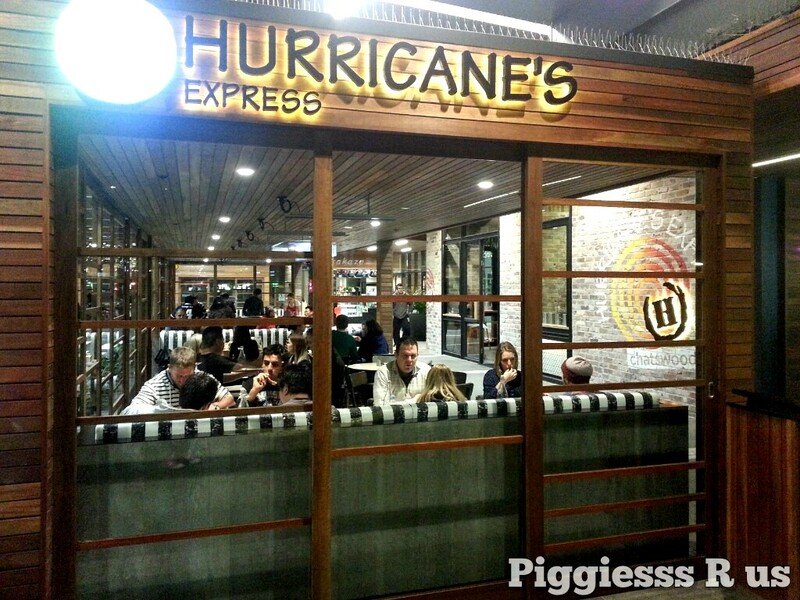 The second of the three newest dining in Westfield Chatswood – Hurricane’s Express is a hands-down crowd pleaser. 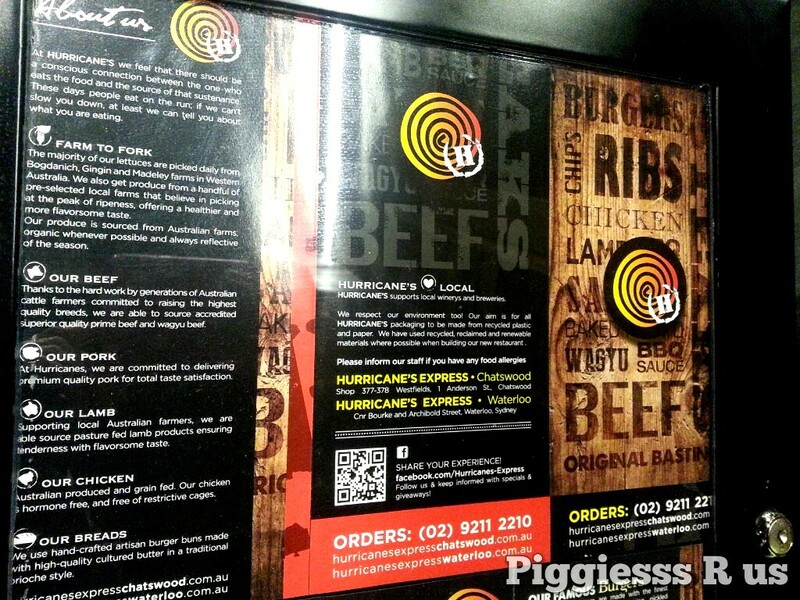 Located on Anderson Street right next to the Hoyts entrance, you can smell the ribs while waiting at the traffic lights. Hurricane’s Express is unlike the one in the city where you have to queue up for a long time because , as the name suggest, it is EXPRESS and that’s what I love about it – you don’t need to wait too long for, well, anything! This self serve restaurant’s concept is simple. We did exactly as we’re told and within 10 minutes (7 to be precise), we already received our order. 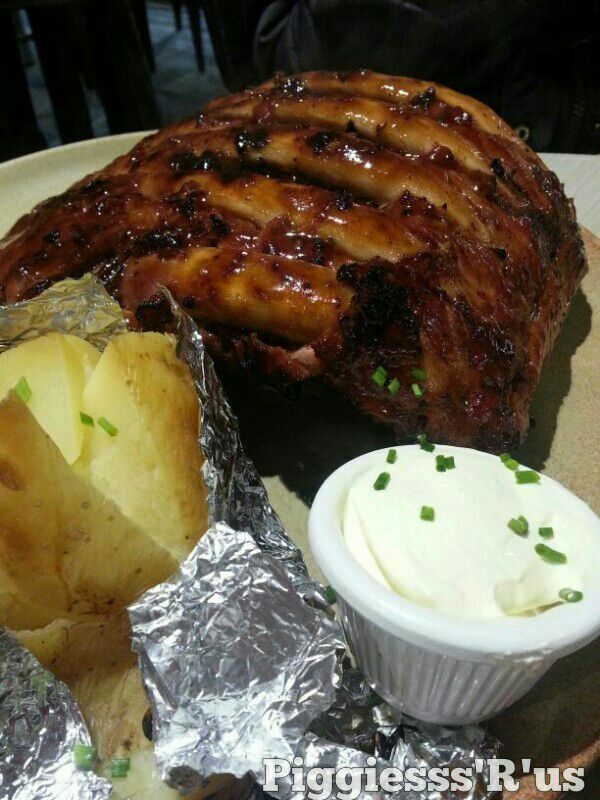 Hurricane’s Ribs, basted in the famous Original Hurricane’s basting, until caramelised. 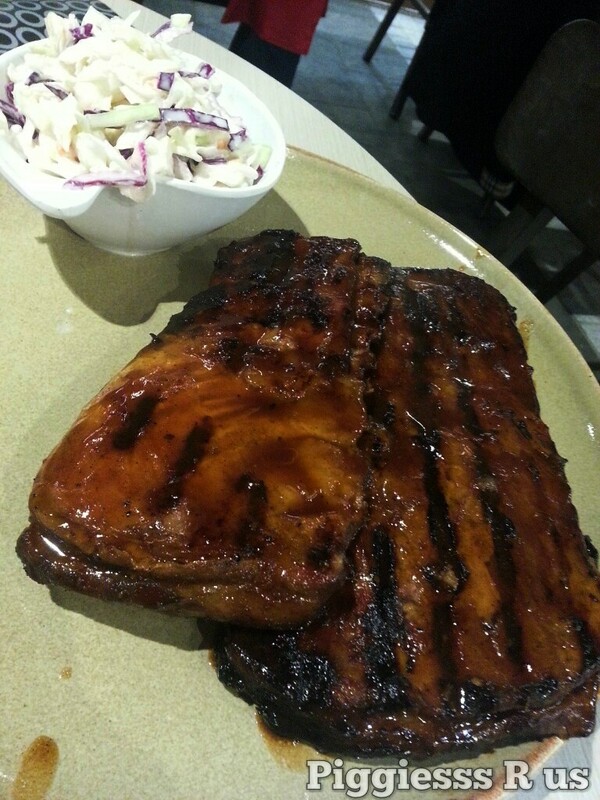 As everyone that’s been to Hurricane’s would know, you can’t go wrong with ribs when you’re at Hurricane’s, and at Chatswood, it’s not any different. The lamb was juicy and it did not have the distinctive strong smell that’s normally associated with lamb. I also love it when barbequed food has that extra bit of black charcoal on the top (don’t worry I know not to eat too much because it is carcinogenic – cancer causing). The coleslaw was crisp and perfect to keep our tummy fresh – only wished we ordered more! Only one word to describe it – HEAVENLY !!! The baked potato sides were also nice and warm. I also like to put a little bit of sour cream every once in a while to cleanse my palette and tummy so I don’t get overwhelmed with the food. Hurricane’s burgers are made with the finest ingredients; lettuce, tomato, red onion, pickled cucumber and a brioche bun. As soon as the burger came out, I knew this was it. It was a perfectly glossy and crisp looking sesame brioche bun and the burger had everything I wanted. 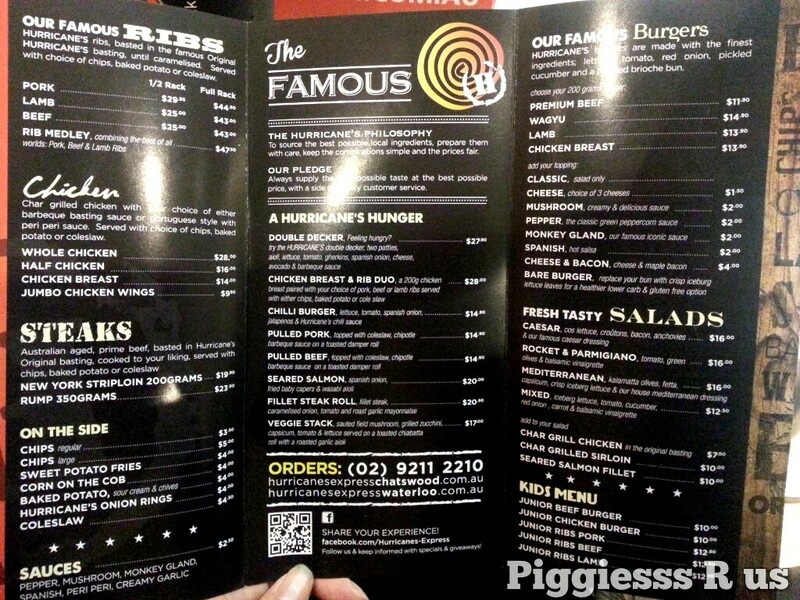 I have a big love for burgers and this place does not disappoint. The monkey gland sauce (which is just a fancy name for the famous iconic sauce) was served on the side – I really RECOMMEND you get this sauce to spread on the inside of your brioche bun as the sauce made the burger extra juicy. As for the burger – it was massive – you really had to hold down the two buns together to make sure you get every bit of it in your mouth. 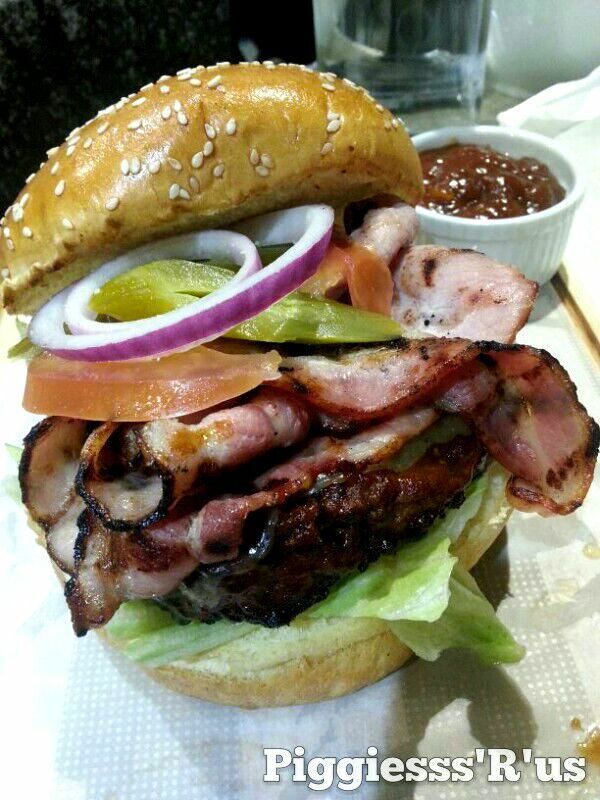 The bacon was crisp and the beef was tender and if you’re a burger fan, you must get your hands on this ! 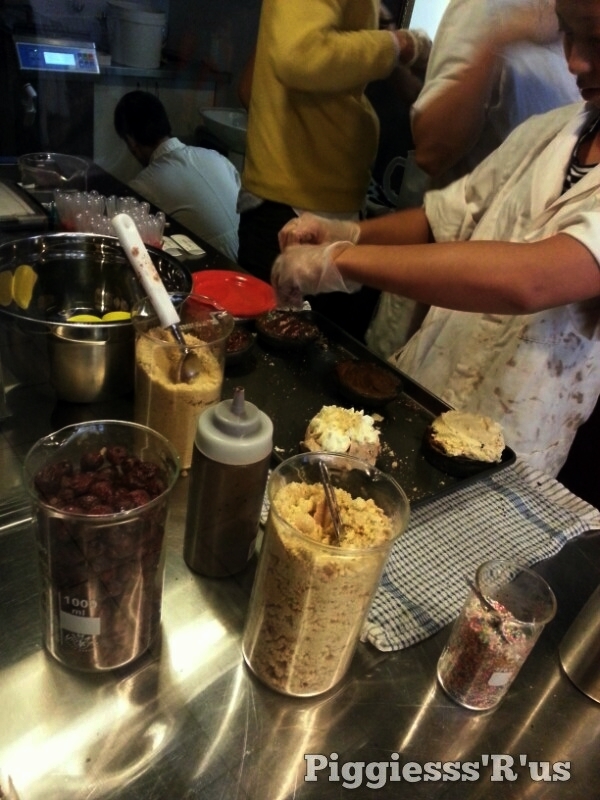 Overall – I LOVE THIS PLACE – JUST GO TRY IT OUT, NOW !! FREE TICKETS TO THE GOOD FOOD AND WINE SHOW 2014!! 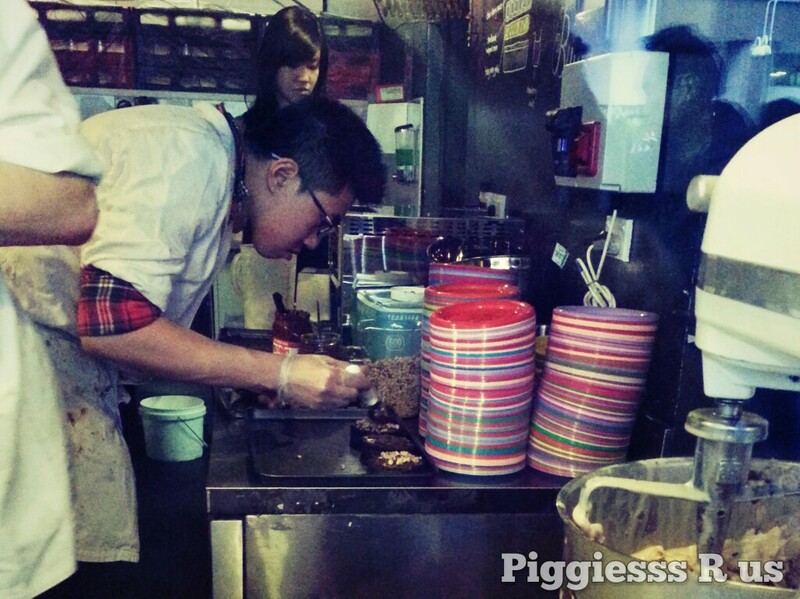 Simply LIKE piggiess’R’us fb page! 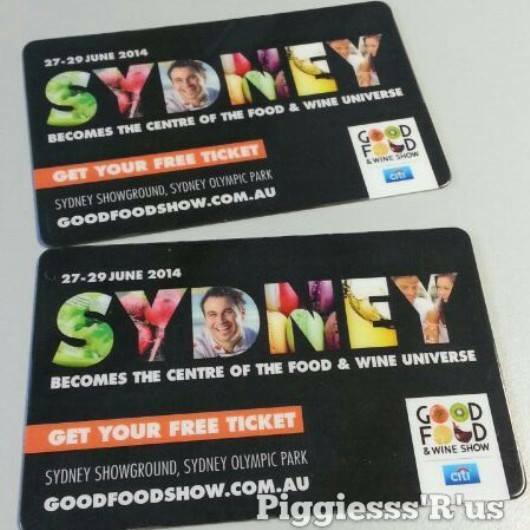 SHARE AND LIKE this post on fb for your chance to #win 2 #FREE#tickets this #weekend to the good #food and #wine #show at the #Sydney #showground 27th-29th june. Winners will be announced at 4pm 25/6! What are you waiting for!!! 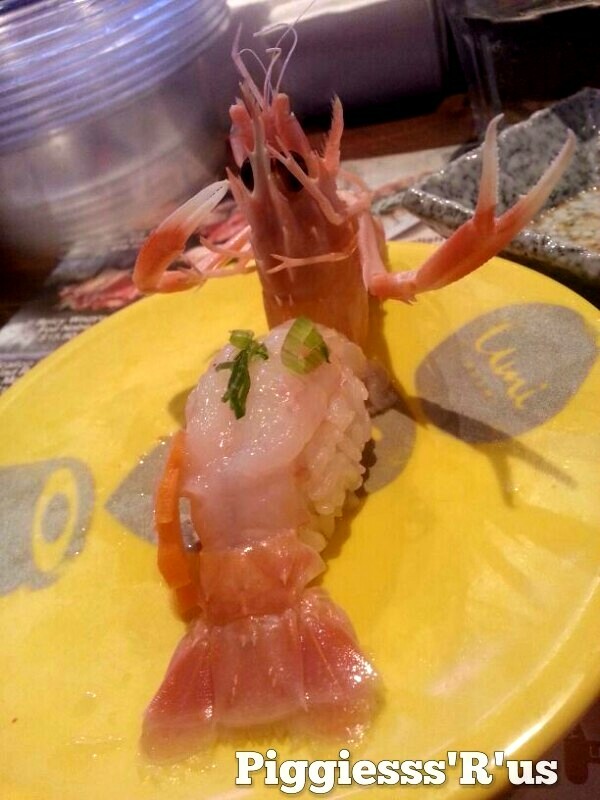 The $2 Sushi Special is on again !!! 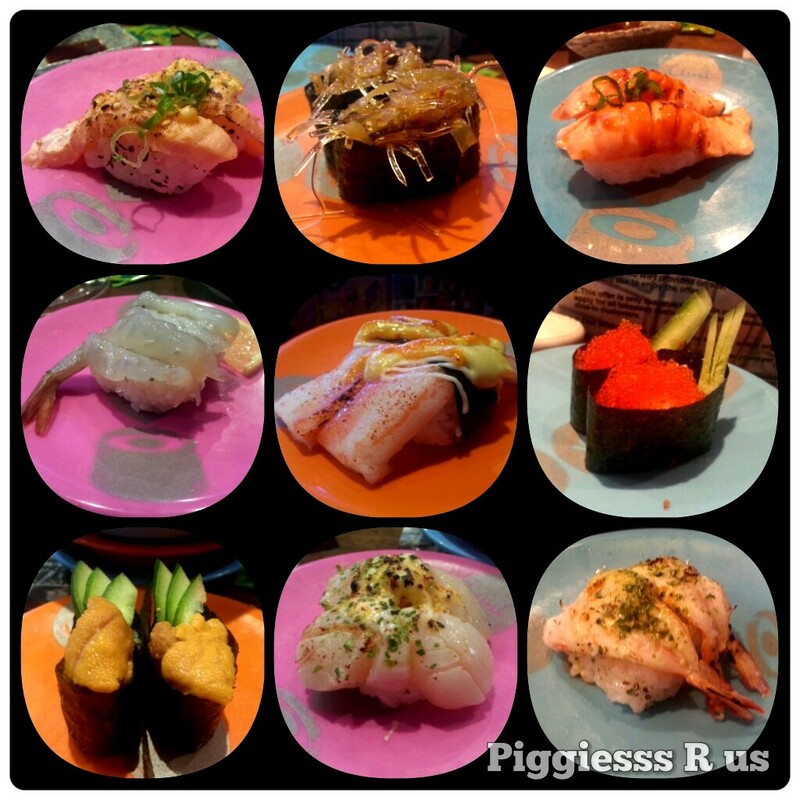 If you missed out last year at Umi Sushi, Darling Quarter, then you better be quick to get their deal – from 11/6/14 ~ 18/6/14 ! If you haven’t been here before, it’s located within the Event Cinemas Complex (if you’re still not sure, look out for the line of people and you know you’re at the right place). The line this year was unexpectedly shorter. 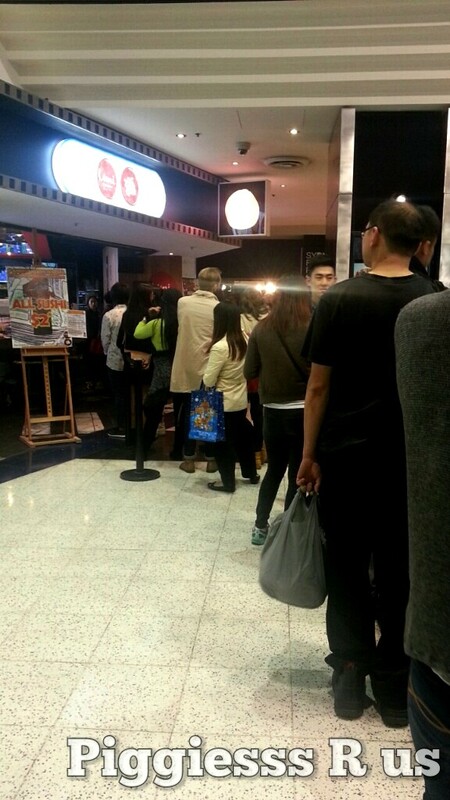 When I got there to wait in the queue, there were only approx 10 people (or 5 groups) waiting in front of me. When I came back from the toilet after my initial 15 minute wait (less than 30 minute wait time in total), we were already seated down. Umi Sushi Express is cosy and has a modern Japanese fitout with the electronic boards, like those you would typically see when you’re in Japan. There were also four sushi masters in the middle of the train that night to make sure that the orders came quick and fast. 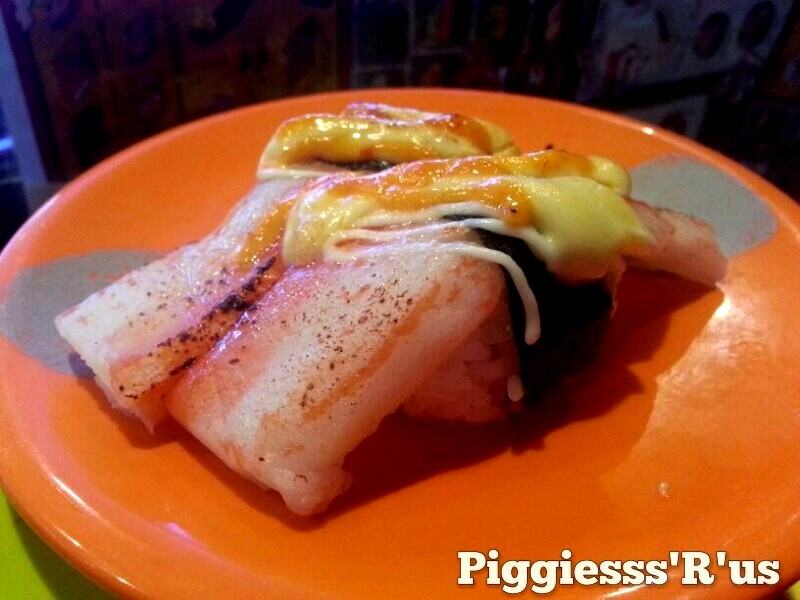 Umi Sushi Express also have a good range of choices which includes Seared Nigiri, Nigiri, Creative Roll, Gunkan, Inside Out Roll and much more… To enjoy your $2 sushi, all you need to do is like and check in Umi Sushi Express on Facebook. Since it’s only $2, we started going crazy on our sushi. 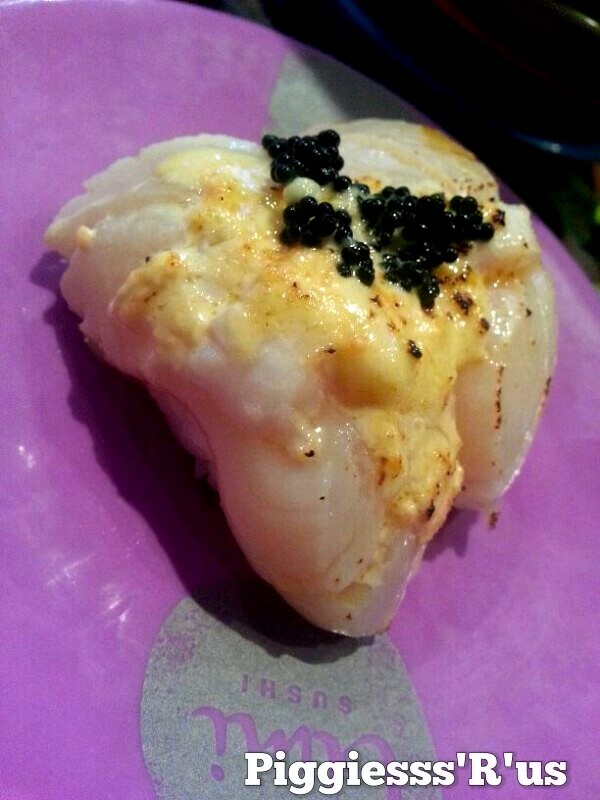 Garlic Volcano Cheese Seared Scallop – The BEST – Try it for yourself ! 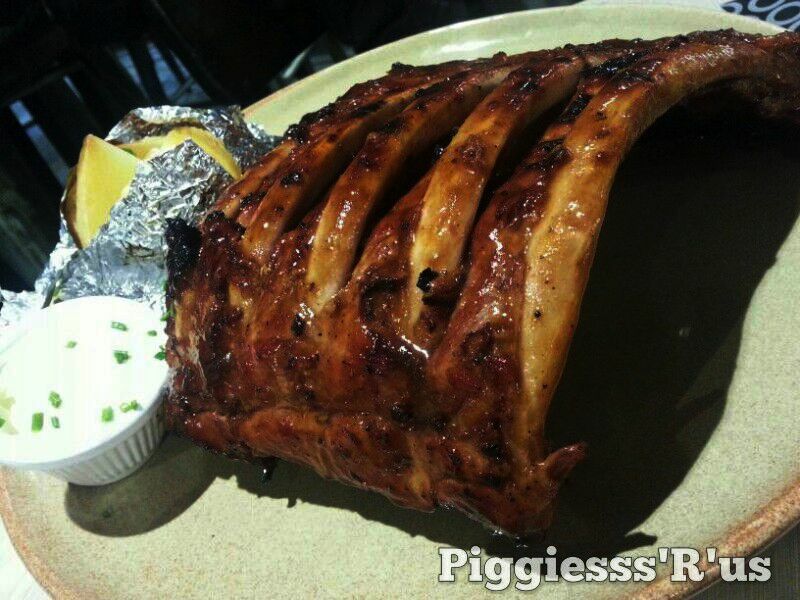 We hope you enjoyed our blog, don’t forget to like our Facebook page Piggiesss.R.Us, follow our Instagram and share our blog with your friends! Three of the newest dining in Westfield are now a hit in Chatswood – Din Tai Fung, Hurricane’s Express and Kingston & Co but first off in this post, let’s start off with Kingston & Co, located on Anderson Street right next to Nandos. 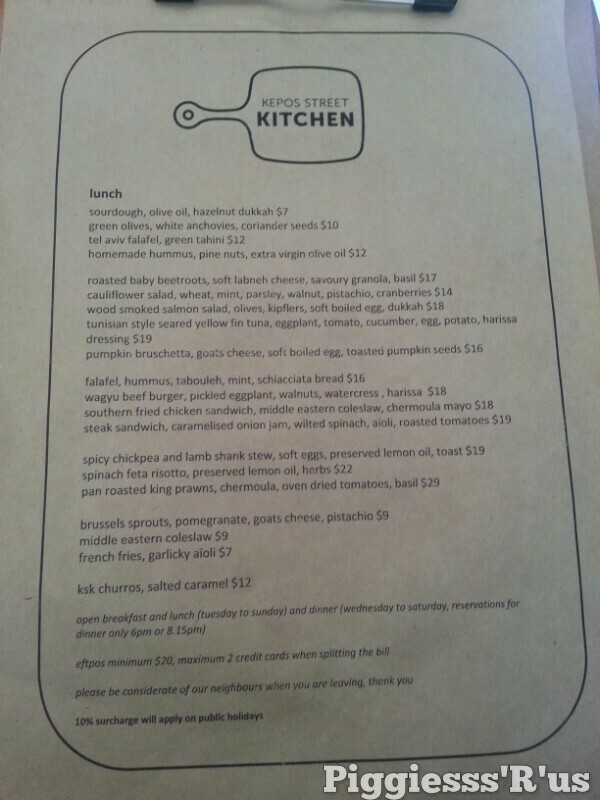 Greeted with a friendly waiter, he directed us to our seats and presented us with the menu for our brunch this weekend. 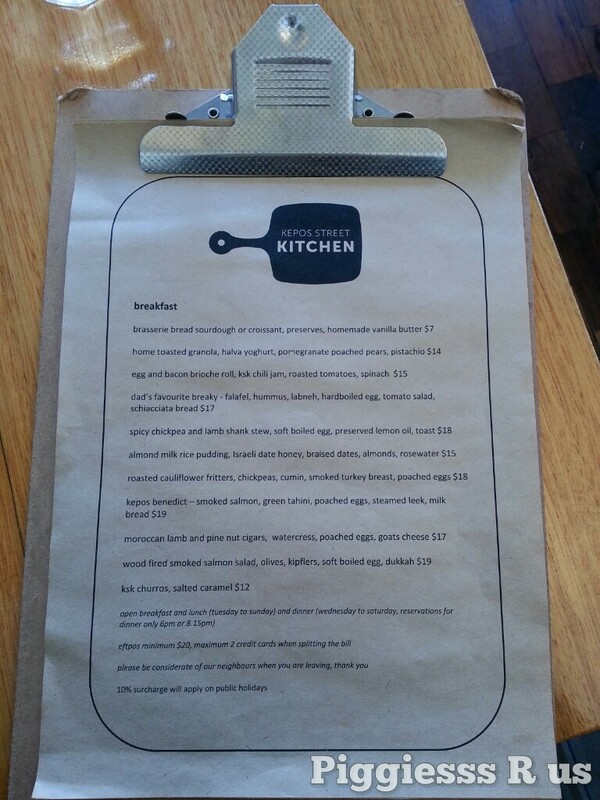 Kingston & Co has a good range of breakfast options available. 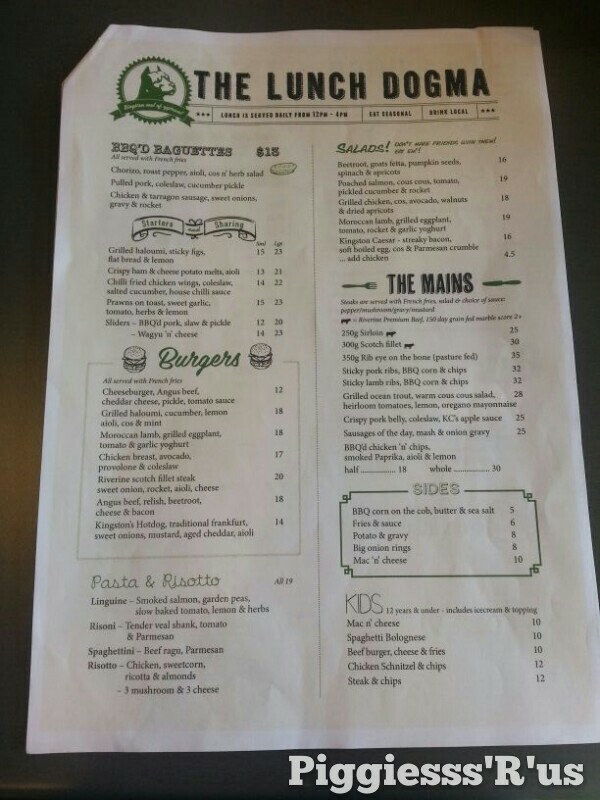 The lunch menu also provides a list of burgers, pasta, risotto, salads, etc. 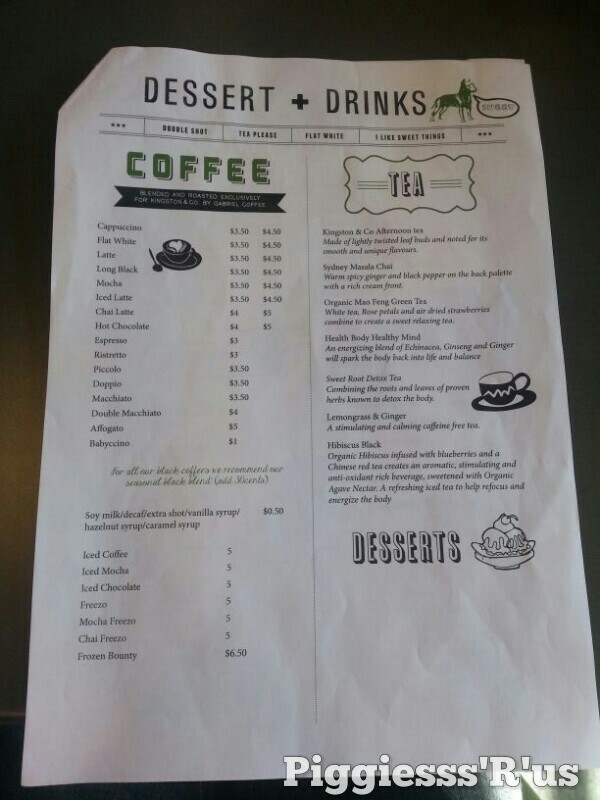 and the last page contains a drinks menu with desserts available at the counter. 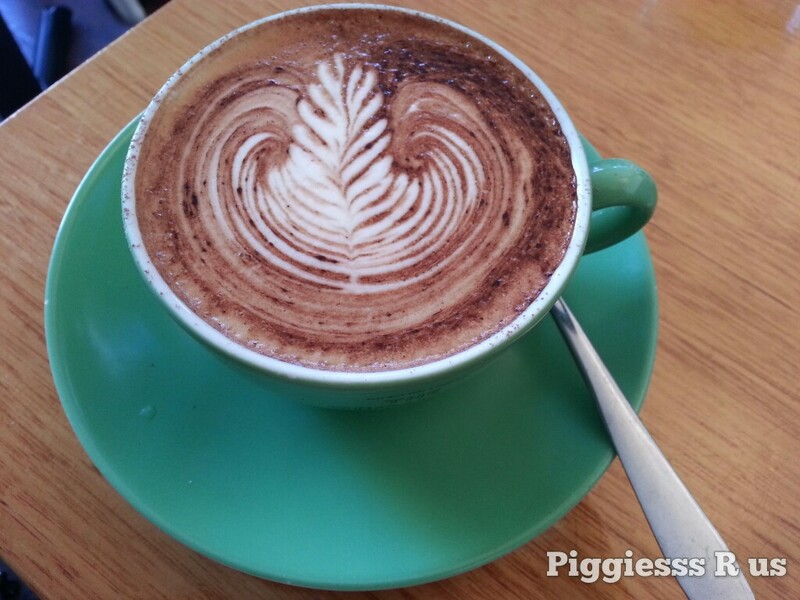 The hot chocolate art was beautifully poured but once you take the first sip, we realised that looks can be deceiving. The barista had our drink too hot, way above the optimal temperature. Two minutes later, we tried to take another sip but it was still too hot. On another note, the hot chocolate also wasn’t rich enough (since I’m a lover of all things sweet), so overall impressions of drinks = below average. 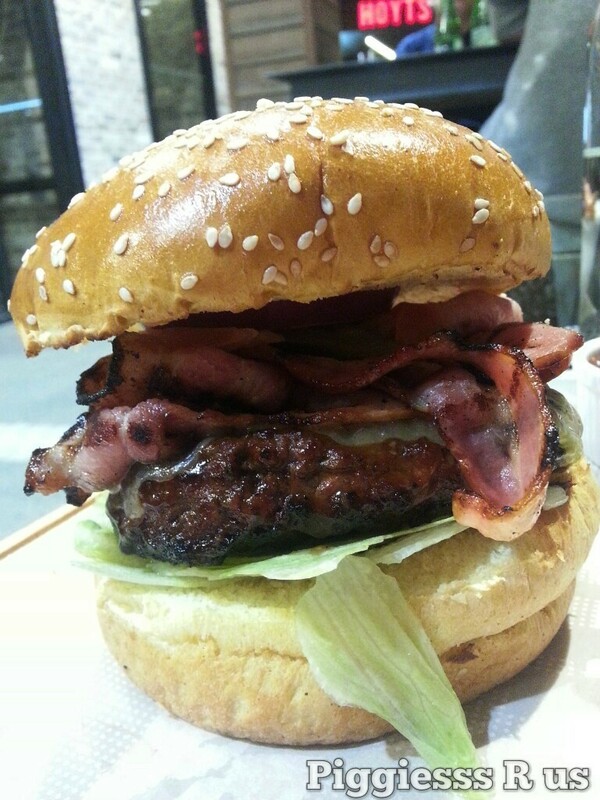 We decided to order a burger to try out as we’ve seen burger posters for Kingston & Co advertised around Westfield Chatswood. 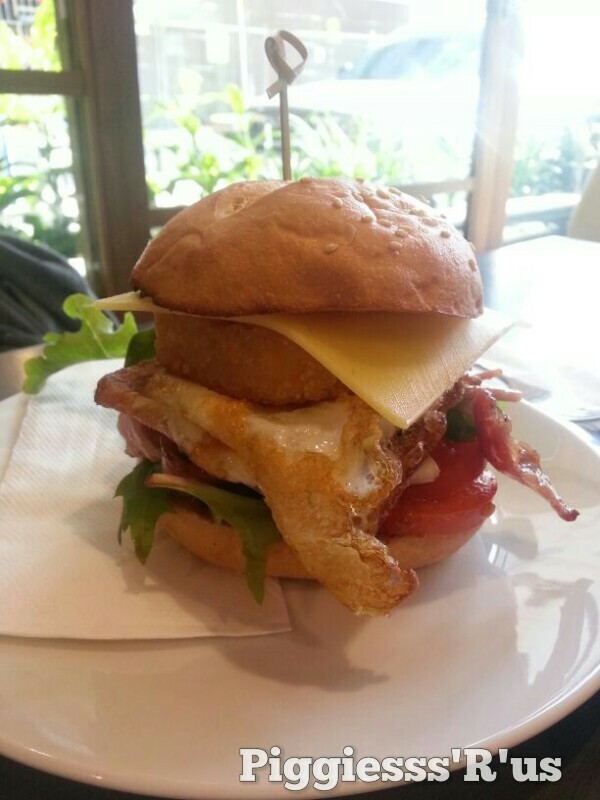 The Kingston’s works burger – ordered from the breakfast menu – has all the essential ingredients in this burger. We ordered this without the chips since it was too early to have chips. It was interesting to see that the hash brown presented itself in the burger as a patty instead of the traditional beef patty burger for breakfast. The meat component came from the bacon which was easy to chew and not too crispy. Although the burger wasn’t as juicy as we liked it to be, the tomato slices in the burger made up and also contributed to the sauce. The house cured ocean trout was a beautifully plated brunch that I almost thought I was at a fine dining restaurant for an entree. 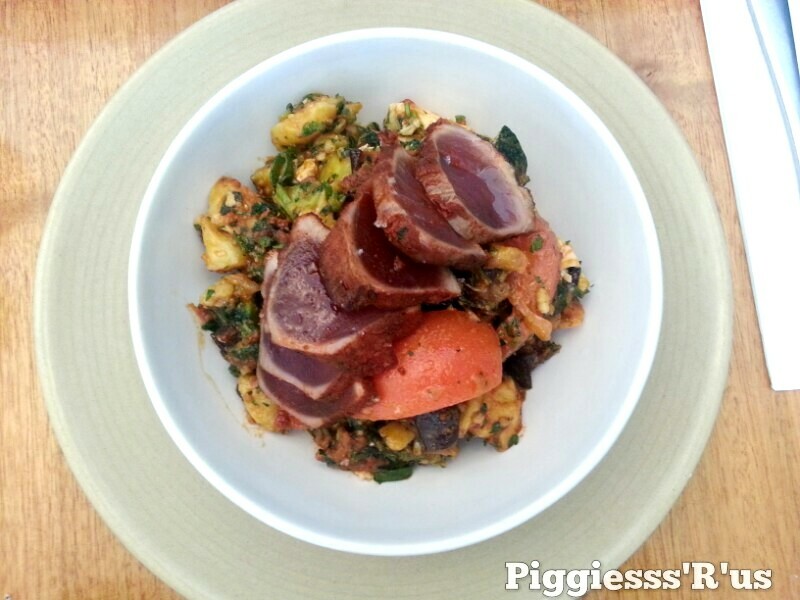 It was difficult to put my cutlery and start as we didn’t want to ruin the dish. 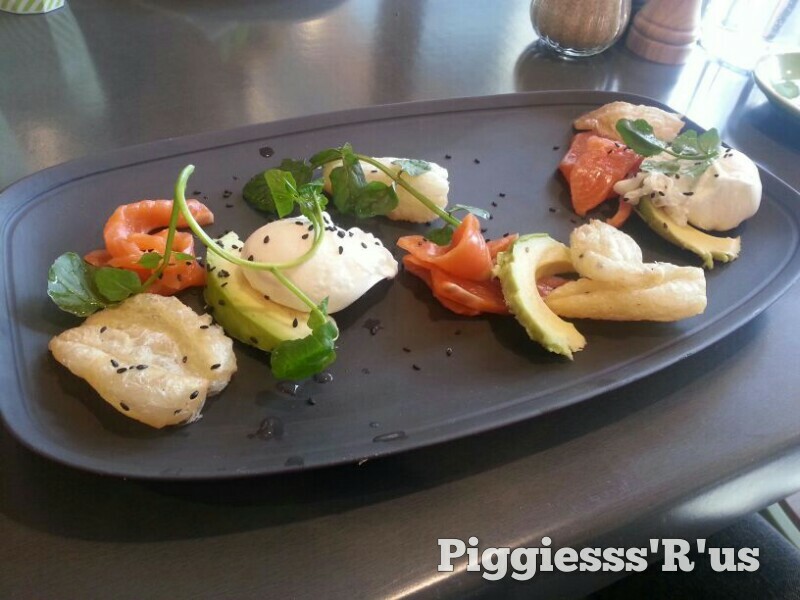 We started off with the ocean trout however it did not spark up any fire with my tastebuds. Both poached eggs were runny but would have been better if there was a slice of bread to accompany the plate instead of the puffed pastry as the puff pastry wasn’t too filling. Also before we paid for the bill, we noticed a range of dessert available at the counter including brownies, tarts, muffins, etc. 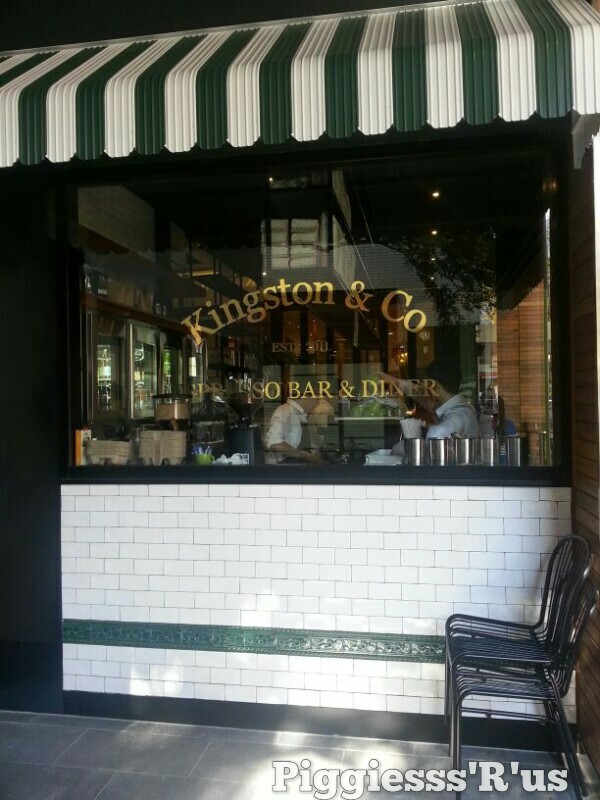 so if you’re wanting to visit Kingston & Co for a catchup with friends, try out their daily desserts special. 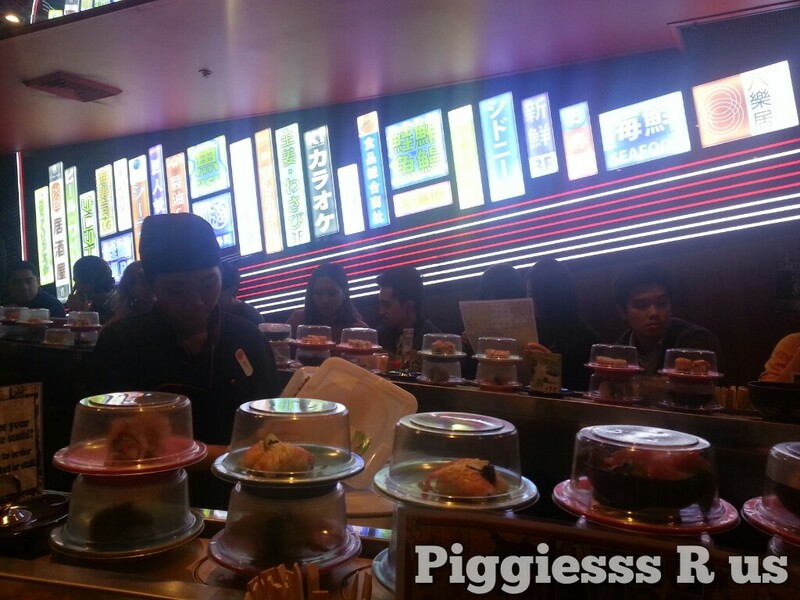 Overall the food presentation added some piggies points to this review however before we re-visit again, the food quality may need a slight improvement (purely based on our experience today). We hope you enjoyed our blog, don’t forget to like our Facebook page Piggiesss.R.Us , follow our instagram and share our blog with your friends! 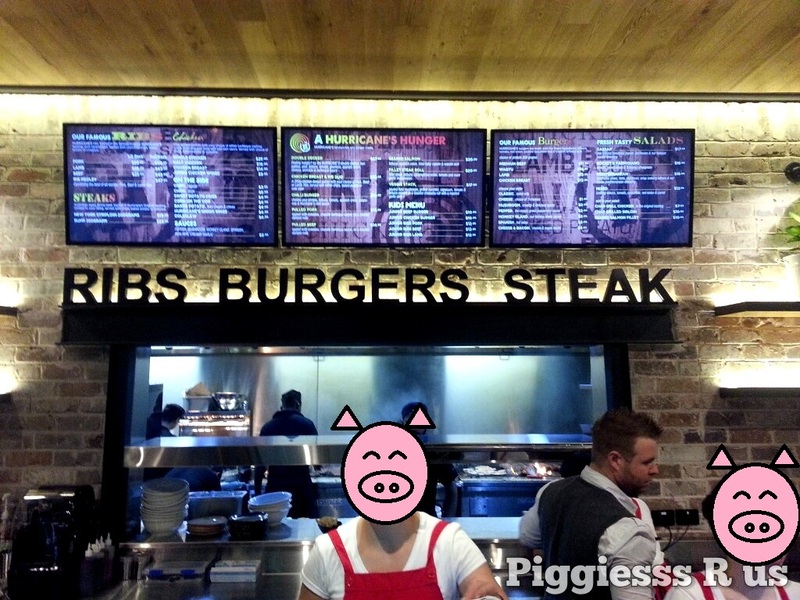 Click HERE to like Piggiesss R Us on Facebook ! !